The other morning I poured some plain old distilled vinegar into a spray bottle, added a squirt or two of dishwashing liquid and attacked my weeds. I don’t necessarily mind pulling weeds, but 1) you have to stay on top of it or they get out of control quickly and 2) it is nearly impossible to get them out of the cracks in the cement completely. While I was spraying, my vinegar-smell hating husband poked his head out the back door and asked if I wanted him to use “real weed killer”. I am pretty sure my solution cost far less than the mystery chemical that was less effective. 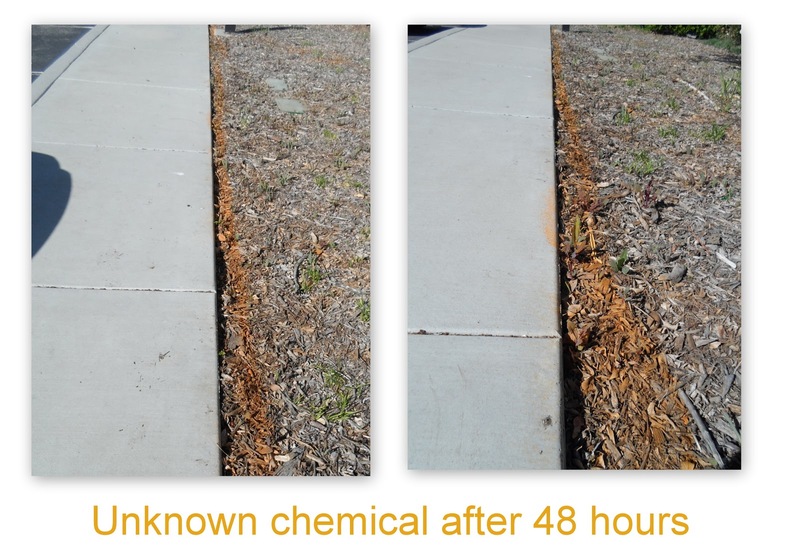 Maybe the City of Murrieta should look into it both to stop exposing residents to chemicals and save tax payer dollars. What kind of dishwashing liquid? Handwashing or Dishwasher washing? I'm on weeding duty at home, so you know I have to try your formula now. The stuff you use for handwashing dishes. I just used a squirt or two. You can use straight vinegar, but the soap is supposed to help penetrate the oily layer on some weeds and make it work faster/better. We can no longer even buy chemical weed killers here in Ontario, so I know a lot of people who will give this one a try. Vanessa, if it weren't so bloody cold up there I'd consider moving to Ontario.